Ultra-violet LED (UV LED) is a device which emits ultraviolet light or waves having wavelength of less than 400nm and is known for its compactness, superior performance, and low cost. Few main applications of UV LED market include air & water purification, medical, and security purposes. Previously, UV lamps were widely used application of UV LED, but the applications of UV LED have enhanced over the time with the growth of UV curing application which utilizes UV-A technology. 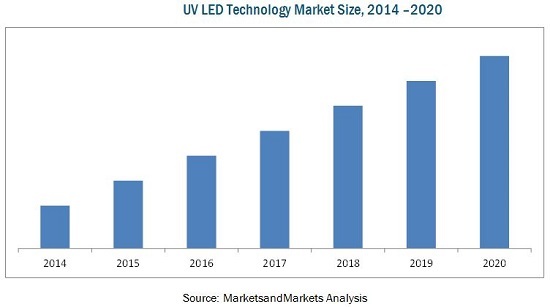 The market for UV LED was valued at USD 82.53 Million in 2014 and is expected to reach USD 369.58 Million by 2020, at a CAGR of 23.17% between 2015 and 2020. With the development of better chips and components, UV LED technology is continuously advancing further. Today, technologically-advanced UV LED devices such as counterfeit detection systems, equipment sterilizers, and curing and coating methods offer best UV LED experiences to users. Initially used in curing and printing applications, the UV LED market is now being used in medical, automotive, security, electronics, and many other applications. The UV LED technology is mainly segmented into UVA, UVB, and UVC technologies. The UVA LED wavelength range between 320-400nm and has high adoption rate because of the presence of variety of UVA applications such as counterfeit detection, UV curing, forensics, and many others. They also have the capability to serve number of existing and new applications. The UVC technology is expected to grow at the highest growth rate in the coming years as it is mainly used for germicidal & sterilization purposes, protein analysis, and other applications of the medical and sterilization segments. The UV LED market is also segmented on the basis of application into industrial, medical and scientific, sterilization, and security application. This market includes a number of manufacturers of UV LED system, UV chips and components, UV sterilizers, UV inks, UV coating system, and Counterfeit detectors among others. The major active companies in this market include by LG Electronics Inc. (South Korea), Koninklijke Philips N.V. (Netherlands), Honle Group (Germany), Nordson Corporation (U.S.), SemiLEDs Corporation (Taiwan), and other companies such as Halma Plc (U.K.), Heraeus Holding GmbH (Germany), Crystal IS Inc. (U.S.), Seoul Viosys Co, Ltd. (South Korea), Sensor Electronics Technology Inc. (U.S.), and Nichia Corporation (Japan), and many more. The total UV LED market is expected to grow at a CAGR of 23.17% between 2015 and 2020. The market is analyzed with a special focus on high growth applications. The report includes the detailed Porter’s analysis and timelines of Market. The major market trends, drivers, and restraints of the market are analyzed. The illustrative segmentation, analysis, and forecast of the major geographical markets give an overall view of the market. The future of UV LED is studied and estimated from technical as well as market-oriented perspectives. The detailed competitive landscape is provided with identification of the key players. The UV LED technology is used in various applications such as industrial, medical & scientific, sterilization, and security. Several companies are investing heavily in the research and development of innovative UV LED devices because of its lucrative growth potential. Various applications of the UV LED market such as curing, printing, forensic, coating, R&D, disinfection, counterfeit detection, deodorization, and others mainly use wavelengths from 100 to 400nm. The market is expected to grow rapidly in the coming years; the market is expected to reach USD 369.58 Million by 2020, at a considerable CAGR of 23.17% between 2015 and 2020. UV LED can be segmented on the basis of the technology types, namely, UVA, UVB, and UVC. The UVA comprises wavelength range between 320-400nm and has high adoption rate because of the presence of variety of UVA applications such as counterfeit detection, UV curing, forensics, and so on. They also have the capability to serve number of existing and new applications. The UVC technology is growing with the highest growth rate of 34.70% in the UV LED market. In this report UV LED applications such as industrial, medical & scientific, security and sterilization are considered. The industrial segment has a major share in the market owing to its capability to provide better performance, in terms of printing, curing, coating and so on. The sterilization market is expected to grow rapidly in the coming years given the increasing growth of UV LED applications such as disinfection and deodorization. This report describes market trends, drivers, and challenges for the market and forecasts the UV LED market size for the period between 2015 and 2020, on the basis of technology, application, and geography. The company profiles include the company overview, products & services, and the recent developments. This report covers regions such as North America, Europe, APAC, and RoW (Rest of the World). The growth of the UV LED market is driven by the availability of advanced UV LED devices such as evolution of mercury lamp to UV LED lamp and the increasing demand for UV LED in the disinfection and curing applications. The APAC region held the largest share in market, followed by the North America region. Some of the major companies present in the market are LG Electronics Inc. (South Korea), Koninklijke Philips N.V. (Netherlands), Honle Group (Germany), Nordson Corporation (U.S.), SemiLEDs Corporation (Taiwan), Halma Plc (U.K.), Heraeus Holding GmbH (Germany), Crystal IS Inc. (U.S.), Seoul Viosys Co, Ltd. (South Korea), Sensor Electronics Technology Inc. (U.S.), and Nichia Corporation (Japan) among others. 11.12 Sensor Electronic Technology, Inc.